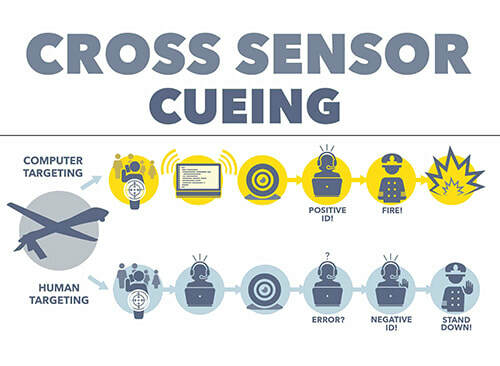 Cross Sensor Cueing - Drone Inc.
With the bewildering amount of raw data streaming back from multiple sensors on drones, and an array of tools to analyze the information, the Pentagon has been working to simplify and automate target selection. While truly autonomous artificial intelligence systems are still many years away, these new target selection systems are helping remove humans from the killing process. In essence, this means that when an individual on a wanted target list briefly turns on a listed mobile phone, and as soon an overhead drone or a land tower picks up the phone’s signal, the NCCT system can rapidly send a message to the closest drone video camera and point it toward the phone. An imagery analyst watching this video feed would not necessarily know what technology, systems, or people were involved in tracking the device. One principal challenge in building such a system was the fact that different types of sensors collect different types of data, meaning that each sensor essentially speaks a different language and cannot communicate outside of that language. This CoT methodology made it easy for algorithms to identify targets and spare human operators the laborious work of comparing multiple kinds of sensor information, such as video, thermal, and phone location data. But to do this, systems like cursor-on-target oversimplify the problem, throw out any contradictory data, and can end up creating a cart-leading-the-horse approach: They define a target in order to take it out, rather than assess whether the target is even the correct one. This strategy risks producing what statisticians call confirmation bias: the tendency to interpret evidence as confirmation of an existing theory or conclusion. Ticom sells GEOnet, originally known as ISRnet, which is software that enables a single operator to control multiple sensors from the same workstation, allowing these sensors to work together to geolocate a mobile phone or similar communications device.134 The company specializes in networking sensors to perform T/FDOA, the more complex geolocation method described previously. How accurate is Ticom’s geolocation software? Without access to an independent audit, it is hard to tell, but as in the case of Netezza, there is at least one engineer who claims that the algorithms are inaccurate. The lawsuit alleges two things. First Henneberger claims that he was cheated out of a million dollar stake in Ticom when it was snapped up by Six3 and then by CACI. In interviews with CorpWatch, Henneberger confirmed the role of Ticom’s technology, but, after talking to his lawyers, declined to provide any more details.